Free West Papua Campaign relayed reports from West Papua that in Yahukimo two high school students, Hariel Lulu and Arpius Magayang, were handing out leaflets which described the outcome of the Pacific Islands Forum (PIF)held the previous week in Port Moresby. Police stopped the students, beat them and forced them to eat the leaflets. This occured on Papua New Guinea’s Independence Day. This isn’t the first time an independence day has been marred by Indonesian state violence. On Indonesia’s independence day, August 16, Fredi Wenda, a relative of Benny Wenda, was stopped by Indonesian police at a checkpoint. He was questioned but refused to reveal his name. When he tried to escape he was beaten. When police finally found out his surname, they killed him by stabbing him in the neck with a knife. “I know that the Indonesian military is targeting my family to target me … Neither I nor my people will be terrorised into submission by Indonesian state brutality against us,” Benny Wenda said on August 19. The PIF had discussed West Papua the previous week. But the issue has divided opinion among forum members. PNG, Australia, New Zealand and Fiji have tended to side with Indonesia over the matter. Wenda had been invited to a human rights refugee conference in PNG, and also wanted to take part in the PIF. But his visa applications were rejected twice so he was unable to attend. Wenda disputed the PNG government’s claim that he had not completed the application process, saying he had a lawyer check his forms. “I respect the decision by PNG government and its immigration department, but I hereby appeal to the government to not penalise the struggle of the people of West Papua,” he said. The PIF communiqué recognised Indonesian sovereignty over West Papua but noted concern for human rights abuses. It resolved that the forum chair, PNG Prime Minister Peter O’Neill, convey these views to Indonesia and pursue a fact-finding mission to West Papua. PNG foreign minister Rimbik Pato said his country will not endanger the good relationship it has with Indonesia when it comes to West Papua, Radio New Zealand International said on September 9. New Zealand foreign minister Murray McCully said he did not support a PIF fact-finding mission to West Papua. “I haven't seen a role for a fact-finding mission but I think a healthy discussion about this matter amongst leaders will be useful and I think that Papua New Guinea and the chair will bring a good sense of balance and judgement to that discussion,” he said. Indonesia’s vice minister for foreign affairs Abdurrahman Mohamed Fachir said: “I think this is not the right forum to discuss West Papua for a number of reasons. We are here discussing important economic development, co-operation, how to address climate change, maritime, fisheries and ICT connectivity for the Pacific,” the September 11 Solomon Star reported. But West Papua was not entirely without friends at the summit. Solomon Islands PM Manasseh Sogavare included in his delegation his Special Envoy on West Papua Matthew Wale and leader of the ULMWP Octavanius Mote. Sogavare said: “Bringing West Papua to the agenda of the Pacific Islands Forum is within the framework of the Leaders meeting. We are not going outside that mandate … By virtue of our membership of the UN we recognise the sovereignty of Indonesia over West Papua. But the same United Nations recognises the rights of people for self-determination and violation against human rights,” the Solomon Star reported. 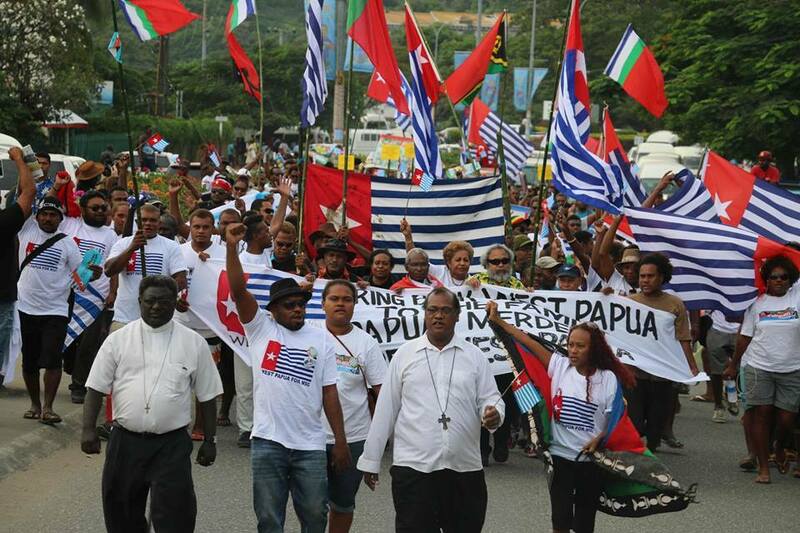 West Papuans and their supporters praised Solomon Islands for upholding its tradition of supporting the West Papuan cause. When Sogavare returned to Solomon Islands on September 15, he was greeted by a large crowd of West Papua campaigners, the September 16 Solomon Star reported.